We are trusted as the leading oxygen plant manufacturer that has been fabricating and supplying Oxygen cylinder filling gas plant for over three decades. We have acquired high expertise in the fabricating of the medical oxygen generator plant machinery. We have become famous all over the globe for using cutting-edge technology and top-notch designing. Our oxygen filling plants are unmatched in terms performance, reliability, durability and prices. Our oxygen production plants are manufactured using cryogenic distillation technology, which helps our plant machinery to generate oxygen with purity up to 99.7%, which is sufficient for medical applications. Our premium quality oxygen cylinder filling gas plants come in all sizes ranging from 20 Liter/hour to 5,000 Liter/hour. 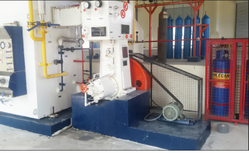 Our company manufactures, fabricates and supplies high quality oxygen generator plants. For supplying high standard products, we have emerged as the leading manufacturing in the engineering sector. For strict compliance with quality control measures, we have been given ISO 9001:2008 and CE certifications. Since our establishment in 1987, we have made our name by manufacturing and supplying the best plants and equipment. Over the years, we have sold over 500 oxygen gas plants to clients all over the globe including Arabia, Qatar, Kuwait, Iraq, Iran, Afghanistan, South Africa, Yemen, Sudan, Peru, etc. Our clients are satisfied with the quality of our product and after sales service. DCPL is famous for manufacturing, fabricating and Oxygen cylinder filling system using high quality materials. Superior technology is used in the fabricating of the oxygen plant machinery.Components used in the oxygen producing machinery are bought only from the best providers. Our oxygen production systems are manufactured using the latest cryogenic distillation technique. Functioning of the technology is based on the process cycle of Linde Claude, which was developed in 1930s and has been updated many times since then. We fabricate plant machinery in different sizes and capacities ranging from 20m3/hour to 50,000m3/hour. Our Oxygen cylinder filling system is manufactured using state of the art know-how. Equipped with an in-house R D unit, we fabricate and manufacture oxygen generating plants as per the changing requirements of the customers. Our oxygen gas filling plants are unmatched in terms of performance, innovation and prices. Each machine is put through vigorous testing before it is cleared for sale to the clients. Our factory is located in New Delhi (India) where we comply with the strict quality control processes for fabricating and manufacturing of oxygen plants. We have been given ISO 9001:2008 and CE certifications. Looking for Oxygen Cylinder Filling Plant ?